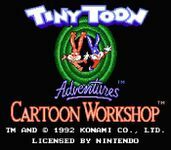 Tiny Toon Adventures Cartoon Workshop is a game for the Nintendo Entertainment System based on Tiny Toon Adventures. It was developed by Novotrade and released by Konami on August 17, 1992. This game was an attempt to turn players of video games into directors. It puts players in the director's seat, and enabling them to make their own cartoons. Up to two characters can be featured on screen at once, with Buster, Babs, Plucky, Furrball, Calamity, and Little Beeper available for selection. The characters can be set in many different poses and situations, and the cartoons have a myriad of settings and backgrounds for the show to take place. There are also options for musical inserts, sound effects, captions, and editing features. Saving the cartoon is not possible, however, unless one uses a VCR or other screen capture method.